1 pint straight carlsberg branded glass. Condition is New. Dispatched with Royal Mail 2nd Class. Stamped half pint and 1965. Perfect CARLSBERG Vintage Glass 4 Pints Beer Lager Jug Pitcher Man cave party. Condition is New. Shiny glass just dulled with flash. Dispatched with Royal Mail 2nd Class. Please pay within 24hrs. Many thanks. CARLSBERG EXPORT. HALF PINT 2043TO LINE. STATED AS "USED" HOWEVER THIS GLASS IS UNUSED. 1847 PREMIUM LARGER. HAS BEEN SITTING IN MY DISPLAY CABINET THAT I HAVE ALREADY SOLD. do my best to provide as much information as possible. Never been used 2 x Carlsberg Export 2017 edition pint glasses with original boxes. SUPERBLY MADE TOUGHENED 2017 EDITION COLLECTORS GLASS ETCHED AND EMBOSSED WITH CARLSBERG LOGOS - NEW AND COMPLETE WITH PRESENTATION BOX. 2 Bintage Carlsberg Glasses. Both 13 cm tall and half pint size. Only difference is one has gold rim. No chips or cracks. 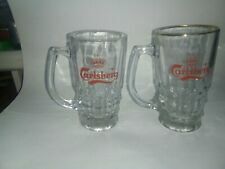 FOR SALE 2 GENUINE UNUSED CARLSBER G 1PT/20OZ GLASSES. THESE GLASSES ARE CE MARKED, TOUGHENED AND NUCLEATED. NEW - CARLSBERG LAGER EMBOSSED BEER GLASS (0.25L). The headquarters are in Copenhagen, Denmark. In 2009 Carlsberg is the 4th largest brewery group in the world employing around 45,000 people. Carlsberg was founded by J. C. Jacobsen; the first brew was finished on 10 November 1847. 3 x 1 Pint Carlsberg Glasses. I have a number of these unused. Limited Edition Carlsberg Export Beer Lager Boxed Pint Glass Exclusive CE. CARLSBERG LAGER 150TH ANNIVERSARY HALF PINT GLASS. ELEGANT SHAPED GLASS. AS WE TAKE GREAT PRIDE IN ENSURING THAT YOU RECEIVE YOUR ITEM IN PERFECT CONDITION. IN AN EXCELLENT, CLEAN, BRIGHT CONDITION. Set of 3 collectable Carlsberg Pint Lager Glasses-. 1 both printed and embossed - Official beer for the Irish team. This is a set of 24 Carlsberg Reward Half 1/2 Pint glasses(285ml/10oz) with its stylish curved, elongated shape. Perfect for a party, bar or a table outdoors. These nucleated beer glasses are fully toughened across its entire body making it resistant to impact damage at all points of the glass. In the rear event that it does break, the entire glass will shatter into small blunt pieces, making it impossible to cause serious lacerations. Dish washer safe. 15 boxes left. Carlsberg Export 1847 PREMIUM LAGER Pint Glass PINT crown 2043 'SO GOOD THE DANES HATE TO SEE IT LEAVE.'. The picture is of a man/friar holding a tankard of beer. Carlsberg half pint lager glass/tankard. There is a half pint mark and line on the back and 'Carlsberg' on the bottom of the glass. Carlsberg Export Toughened Pint and Half Pint Glass (His & Hers) 2 FREE BEER MATS. Set of four different Carlsberg pint glasses. In unused condition with pint mark to glasses. You will receive 1 of each pint glass as shown in the photo. Would make a good addition to any bar or collection. Boxed Carlsberg Pint Glass - Unused - Heavily Embossed - Really Nice Glass! Lovely Carlsberg glass as shown. Never used. The gold gilding is showing signs of wear and there are places where it has rubbed off. There are also a couple of imperfections in the glass. 'Carlsberg' logo on the bottom of the glass. These are sold as a set of 2 x Carlsberg Wave Pint glasses. This is a toughened nucleated glass. Special nucleation points at the bottom of the glass provide a point for the CO2 to 'break out' of the lager to form and maintain the correct head. Carlsberg Export Toughened Half Pint Glass (Set of 2). Carlsberg Lager straight Style Tall Glass. Treat yourself with the Carlsberg Reward Tall Pint Glass, perfect for enjoying a pint of your favourite beer. OFFICIAL pint Carlsberg Beer Glass Wedding Free Gift Box. CARLSBERG CLEAR SHAPED BEER PINT GLASS. ON FRONT AND ON REVERSE EMBOSSED IN GLASS THE CARLSGBERG LOGO ON BOTTOM OF GLASS IN WHITE. NEW, WITHOUT BOX. OTHER MARKINGS ON SIDE . Genuine Carlsberg punt glasses. as good as new. X 27 NEW CARLSBERG BEER 1 PINT TALL GLASSES. Condition is New. Set Of 2 Tall CARLSBERG EMBOSSED PINT Glasses. 1 PINT GLASS. BOXED AND UNUSED. OR FOR THE COLLECTOR. IT HAS THE C E STAMP M 11 ON THE SIDE. Carlsberg Larger glasses, various sizes 4 off. Good condition. This is a lovely shape and should be a good present for the discerning CARLSBERG lager drinker. Great Gift Idea. Also head is maintained for the whole drink. Gifts Gifts Gifts Gifts Gifts Gifts Gifts Gifts Gifts Gifts Gifts Gifts Gifts Gifts Gifts Gifts Gifts.